The proverb “a leopard cannot change its spots” has existed for centuries, but you’d swear that it was coined for pony cars and the performance war that American automakers have been waging since the 1960s. Two oil crises, the increasing strict laws on fuel consumption, pollution, safety and one or two bankruptcies couldn’t end the strife. And in a conflict this volatile, all it takes is the slightest spark for hostilities to be renewed. With the launch of the new Camaro, the battle is on and as fierce as ever. Yes, Mopar fans, I realize that a new Challenger arrived first and that it’s a true muscle car, but this ruthless struggle has always pitted Ford against Chevrolet. It began in 1967 with the launch of the very first Camaro, GM’s response to the incredible success of the Mustang launched in 1965. And yes Mustang fans, I know that the first one is considered a 1964 ½ model. In this war, sometimes Ford and GM’s most valuable allies are the first to break out the big guns. After answering the Camaro SS and its 426 horsepower V8 engine by increasing the Mustang GT’s V8 to 415 horses, Ford turned it up another notch. It pulled the legendary Shelby name out of its bag of tricks for an improved version of the GT500. It was powered by a supercharged V8 with 550 horsepower that was 100 pounds (46 kilos) lighter thanks to a new aluminum engine bloc. It was nothing less than a version of the Ford GT’s V8, minus the dry sump for the oil. No surprise that the first serious rivals of the GT500 were created by SLP, the great American transformation specialist. SLP (for Street Legal Performance) had produced the 40,000 units of the previous Camaro SS in Québec by joining forces with the Montréal-based performance tuner Zeke’s. In fact, the quality of its transformations was such that SLP’s cars came with a 5 year/160,000 km warranty that is honoured by GM dealers. The first Camaro ZL585 was launched in 2010 and its moniker is meant to reflect the power of its 6.2-litre supercharged V8 paired with a six-speed Tremec manual gearbox. In actuality, it generates 592 hp at 6,200 rpm, while the ZL560’s engine with automatic gearbox develops 563 hp at 5,936 rpm. The ZL600 rounds out 2012’s trio and will definitely be more powerful as well. SLP Performance will produce only 250 units per year, all trim levels included, in a coupe or convertible. That’s about half of the amount produced last year. Thus, the Camaro ZL becomes more exclusive but features comparable performance; this year Chevrolet is offering a Camaro ZL1 powered by a 6.2-litre 580-hp turbocharged V8. Ironically, SLP Performance produced its own ZL1 in 2011, and it was a modern interpretation of the rare and mythical late-60s Camaro. It was equipped with a 7-litre (427 cubic inches) all-aluminum, fire-breathing 750 horses, of which SLP produced only 69, like the original. It is a rare creature indeed. Last summer, my colleague, Denis Duquet, published a first test drive of the Camaro ZL585 by SLP on the website. I put it back up again along with a test drive of the same car, acceleration and braking measurements included, on a circuit for The Car Guide’s (Guide de l’auto) T.V. show in French on Canal Vox. By then, that brave ZL585 had already logged more than 21,000 km, many of which under the auspices of journalists who didn’t exactly handle it with care. However, its body was still immaculate and solid, despite an adjustable sport suspension that lowers 2.5 cm in front and 2 cm in back. The ride is firm but under control on the highway and it doesn’t make a peep. The ZL585 that was tested had 20-inch rims fitted with Michelin Sport Pilot 2 tires with exceptional grip, even when this husky, 1700-kilo coupe was pushed to the limit on a circuit. Big, exaggerated oversteers on the Saint-Eustache road circuit for the purposes of the show weren’t easy to accomplish even with 597 lbs-ft of torque and the anti-skid deactivated. The ZL585 demonstrates almost no roll on the track, and its steering is precise. Too bad about the steering wheel whose spokes plunge toward the hub: it isn’t particularly comfortable and it’s hard to access the commands located on the spokes. It would take all-wheel drive, racing tires, an ideal track and a drag racer to do much better than our 4.7-second 0-100 km/hr time and our 12.78 seconds with a maximum speed of 186 km/hr quarter-mile obtained by keeping wheel slip to a minimum. That’s a one second better than the 0-100 time for the Camaro SS to within a hundredth and nearly the same for the quarter-mile. The brakes have power and stamina with large discs and optional Brembo callipers. Six braking emergencies were simulated at 100 km/hr over an average distance of 37.26 metres, and the ZL585 withstood them all without the slightest loss of efficiency. It earned the same stellar marks on the track where the brakes never weakened during the filming. On the track, the gears engage quickly and cleanly with the short throw shifter and pedals that facilitate the heel-toe technique. The dual-disc clutch that the ZL585 shares with the Corvette ZR1 and Cadillac CTS-V is a joy in normal conditions, and you’ll never tire of the roar you hear when you start the engine with the optional exhaust’s two big bazookas. On the other hand, their dull roar is a lot less pleasant over long periods on the highway at the legal speed limit. This much is certain: you may want to get a ZL585 just for its style if you like classic American sports cars even the slightest bit. With its long and much lower silhouette, it really stands out from the standard Camaro SS. However, the interior is less convincing, despite hound’s tooth fabric on the seats (reminiscent of the first Camaros) and the embroidered ZL585 logos. The seats aren’t as supportive as we’d have liked and they were already showing signs of wear and tear. The dashboard is still unappealing and the materials are of average quality, but that’s typical of all of the current Camaros. 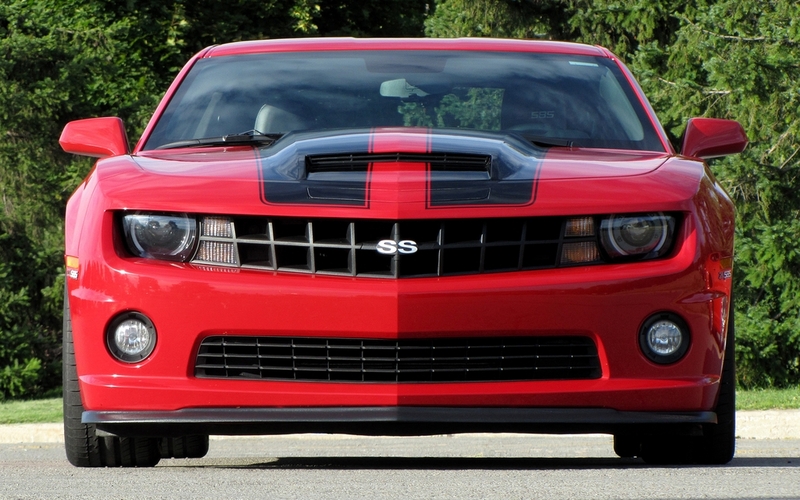 For 2012, the cost of transforming a Camaro SS into a ZL585 increases to $19,995 for a total of about $57,000. That’s just less than the base of the new factory standard Camaro ZL1or a Shelby GT500. Our test car was equipped with all of the options except one, which brought the price to $73,000. Stefano Ciambella of SLP Performance confirms that no buyer adds all of the options. In any case, the battle still rages. Now that Chevrolet is offering its own turbocharged Camaro and that Ford has unveiled a 650-hp Mustang Shelby GT500, we’re betting that SLP is already preparing its response: perhaps a Camaro with a more accessible version of this 750-hp ZL1 that would use an independent rear suspension and the more advanced electronic systems of the standard Camaro ZL1. With the unique touches, strength and exceptional performances that built the reputation of SLP’s cars, there’s no chance you’ll get bored of it any time soon.